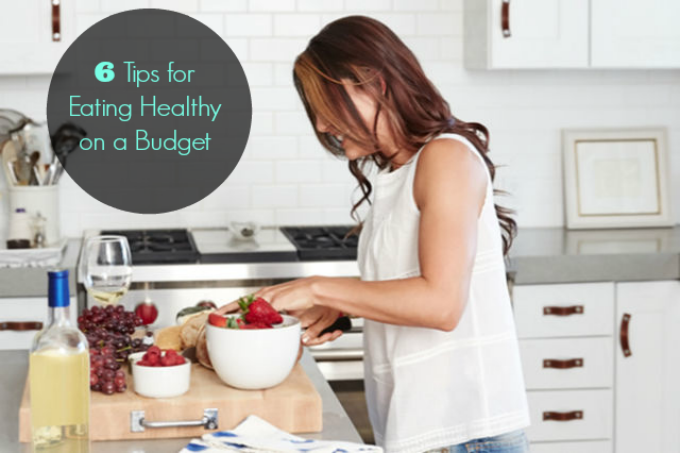 One of the primary barriers to eating healthy is the added grocery expense. To help fill up your home with good-for-you-foods without blowing your budget, we caught up with Andrea Woroch. Andrea is a money-saving expert and has been featured in numerous media outlets from Good Morning America, Today, Dr. Oz to The New York Times. Today she shares with us healthy grocery shopping hacks. 1. Review Frozen Options. Frozen fruits and veggies are an economical way to get your nutrients during any season. Since produce is flash-frozen at its peak ripeness and nutrient content, there's no need to worry about lack of flavor or healthfulness. Opt for store brands over national brands for extra savings. 2. Prep Your Own Food. Consuming fresh fruits and vegetables is important to staying healthy. However, buying these foods pre-sliced, pre-chopped and otherwise prepackaged is unhealthy for your wallet. With a markup of up to 60% for convenience, you can save time and money by purchasing whole foods and setting aside 30 to 45 minutes to do your own chopping. 3. Know Which Organics to Skip. Opting for organic helps you avoid harmful pesticides and fertilizers, but it comes with a price. Fruits and veggies with tough peels -- including bananas, avocados, pineapple and other members of the Clean 15 list -- have built-in protection, so buying them organic is actually a waste of money. Additionally, always look for the USDA Certified Organic label to ensure you get what you're paying for. 4. Stack Savings on Savings. A growing number of healthy brands and health food stores are using coupons to promote their food. Whole Foods shoppers can subscribe to The Whole Deal newsletter or print grocery coupons. Applying these savings on top of grocery store sales can reduce your check-out cost significantly. 5. Get to Know Local Prices. While I don't recommend spending the day driving from store to store to get all your grocery shopping done, knowing where to buy certain items for the cheapest price can help you save more each month. For instance, I found that Sabra hummus is $2 cheaper at Target than my local grocery store and the best price for almond butter is at Trader Joes. 6. Grow Your Own. One of the best ways to save on fresh produce is to grow your own. Start small by planting a few favorite herbs like rosemary, sage or dill, or review this list of the 7 Easiest Vegetables to Grow for Beginners. Apartment dwellers don't have to dismiss this tip, either; vegetables like lettuce, tomatoes, summer squash, eggplant and peppers can be grown in containers. Also eat in season. Produce that would normally be harvest during a specific time of year will be cheaper during that season. If you find a good deal on produce in season, stock up, prep it and freeze it until you need it. Also if a Natural Grocers is nearby they always have a clearance section of meats. These are usually marked down and can be frozen until needed..
Great tips Rachel! Never really though of freezing it until I need it ;) Might do that once strawberries are back in season. Thanks for sharing these useful tips! I will def. be incorporating these tips into my daily budgeting routine evaluations.